What do you do when you need more private rooms in your office space? 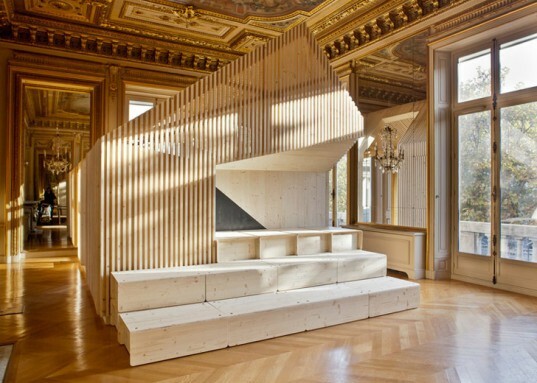 Architect Estelle Vincent solved the problem in an elegant way by adding three timber-framed meeting spaces to the interior of a Parisian office block. The wooden structures are encased in slated timber walls, which provide private spaces where workers at the marketing and data consultation firm Ekimetrics can gather for meetings. The first of the three structures is called Eki Cabin and acts as the center of the boardroom. It can function as a permanent office space for two people. An angular nook is filled with 24 wooden box-stools that can be assembled to accommodate large meetings. The open spaces were connected with various informal areas such as conference rooms. A staircase is located behind the slatted exterior wall and connects the main office space with an upper level crows nest. The largest of the three meeting spaces, the Eki Gallery, is shaped as a house and nestled into a timber framework. An L-shaped bracket printed with the company logo surrounds a soft seat area located in the adjoining reception space. A fourth wooden structure is located in the staff canteen and acts a s a food truck, named Eki Truck. It can function as a permanent office space for two people. 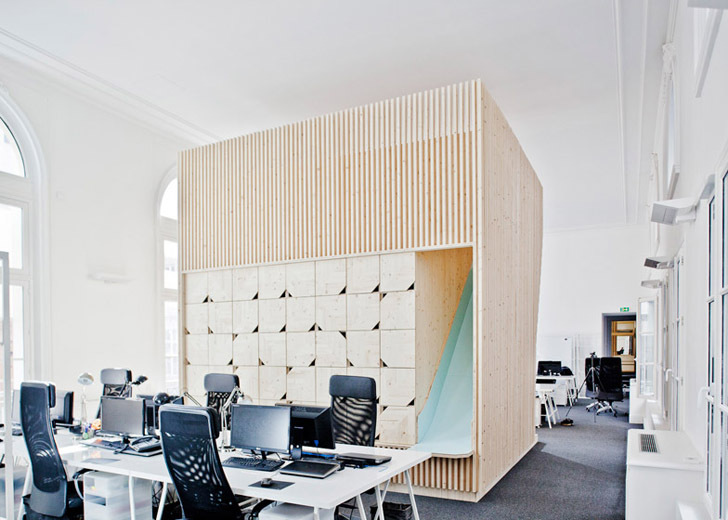 An angular nook is filled with 24 wooden box-stools that can be assembled to accommodate large meetings. The open spaces were connected with various informal areas such as conference rooms. A staircase is located behind the slatted exterior wall and connects the main office space with an upper level crows nest. The largest of the three meeting spaces, the Eki Gallery, is shaped as a house and nestled into a timber framework. The first of the three structures is called Eki Cabin and acts as the center of the boardroom.